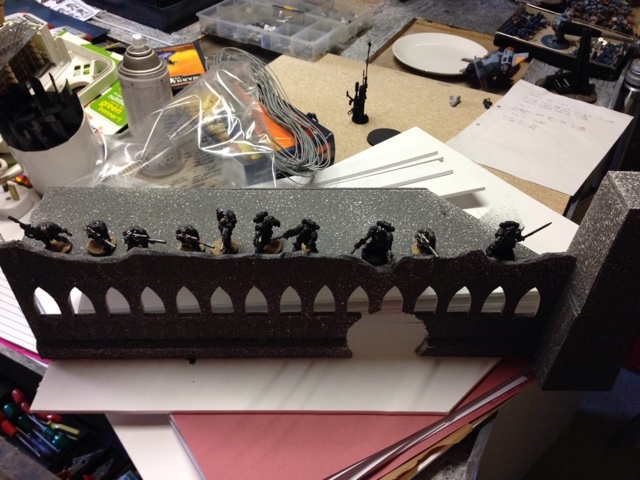 Greetings all, it's been a while since I've done a battle report, partly because some of the games I've played in the meantime have been pretty small and I don't think would have made good reports, others because I simply didn't take notes. Last weekend however, a mate of mine came down from the frozen north for St George's Day and brought his War convocation with him. Time to bring out the Iron Fists I figured, so we set up a game and went toe to toe in the afternoon before getting tarted up for a night out in the evening. Hi all, welcome to part 4 of the Angels of Death supplement review. Today I'm going to look at that chapter that I used to see on the table all the time but haven't for a while. I think though that we could be seeing them again a bit more as a result of these rules! I introduce to you, THE SALAMANDERS! Dusk Knights - CAD versus the Sternhammer? 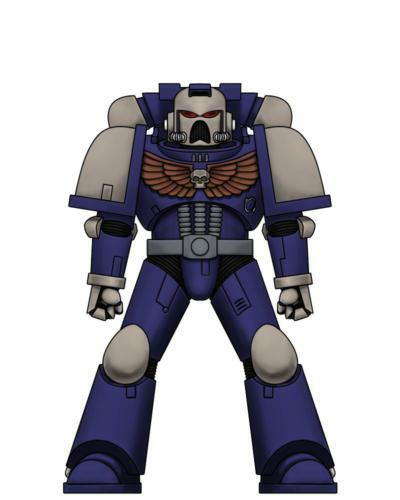 Greetings all, welcome to another list analysis post - today I'm going to be comparing the list I have written for the Dusk Knights using a Combined Arms Detachment (CAD) and a similar list using the Sternhammer Strike Force. This will hopefully illustrate the different strengths and weaknesses of the two methods and the benefits they gain. Well you've been putting up with my seemingly glacial progress on the drop pod for the last few weeks, I can finally give you the good news that it's finished! Well, it still needs to be weathered but I don't have the paints available for that at the moment. 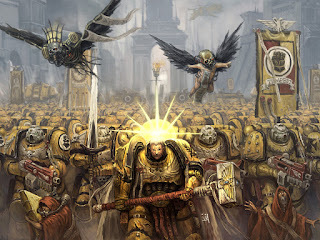 Welcome to part 3 of my Angels of Death supplement review - this time I'm looking at the Imperial Fists, plus the Warlord Traits for both of their successor chapters, the Black Templars and the Crimson Fists. Welcome back everyone to the second part of my review into the Angels of Death supplement. 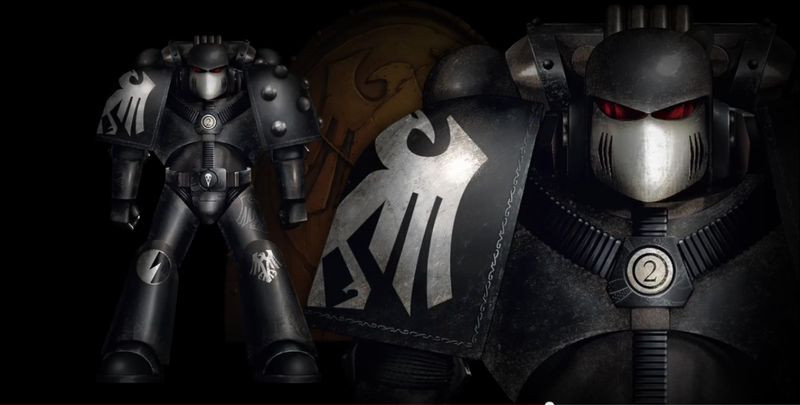 Today I'm going to be looking in detail at the most shadowy of space marine chapters - the Raven Guard. Why them? 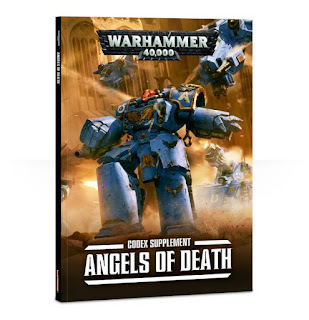 Well quite simply they're right up there with Blood Angels as my favourite of the first founding legions, and they have some quite astounding benefits to play with. Get comfy, cos there's a lot to discuss! Ok peeps, let's get down to this then shall we? Angels of Death supplement. Review time. Let's start with the Anvil Strike Force. Hobby update - Drop pod is nearly finished! I figured today I would do something a little more detailed than usual - I was hoping to have my drop pod finished to show you but sadly RL meant I didn't have quite as much painting time this weekend as I'd anticipated. So what I've got for you instead is a detailed look at how things have progressed so far - I'll do a formal breakdown of the steps with much more in depth photos when it's finished, but for now here's how things have gone!Warning - this post is very pic-heavy, and very word-light! So much potential - I think this is the stage that comes second only to 'finished' in the excitement stakes. Dedicated transport, with optional role as force multiplier using the hunter contingent. It comes as standard with a burst cannon and a pair of gun drones, with an option to change them for a smart missile system. All these weapons have exactly the same shooting stats for strength and AP, so its flexibility is limited to anti-infantry shooting, but as that’s its secondary role anyway, this isn’t much of an issue. Let’s be brutally honest here shall we? The devilfish is not cheap. 80pts for the basic model and kitting it out with the full range of gear will run you to 165, which is quite clearly insane. The high base cost of the devilfish means they work best when they’re kept cheap as possible. I personally really like the smart missile system upgrade for them as it allows them to target a unit that’s out of sight. The other philosophy, that is entirely viable also, is to keep the gun drones as the devilfish, the drones and the unit within it then form a self contained trio of units that can fire at the same target to benefit from the hunter contingent rules for combined fire. The only other upgrades I would consider are the blacksun filter (which to be honest might as well have been incorporated as a default piece of equipment, 1 point seems a little extreme to not be included) and the disruption pod. Particularly in the case of devilfish transporting Breacher teams, the disruption pod is an excellent piece of equipment, as it gives the transport a much better jink save. 90-106pts therefore is the most likely range for this. As with the point above regarding use of the hunter contingent, it most certainly does. This loadout would allow a breacher squad to operate at effective BS4 naturally without the need for support, which means it is far more viable to send them off to deal with isolated targets without having to support them with the rest of your army. Clearly its main role as a transport is extremely synergistic with the units it can be taken for, especially the breachers. It works fairly well with pulse carbine fire warriors too, though it’s not really necessary for the pulse rifle teams, which will probably want to sit pretty still to make the most of their range and the support turrets they should be bringing. Well, obviously if you’re going with a gunline and only taking pulse rifle fire warrior squads then no, it’s not essential and is 100% whimsical. If on the other hand you like to take breachers (and I wholeheartedly recommend that you do) then a devilfish is an absolute essential, and should be considered as part of the base cost of the unit. Maximum output is 8 shots, so nothing outrageous, though I dare you to find another transport in the game that can shoot that many times in one phase without passengers! I think honestly it can only really be classified as a cheddar, the high cost ensures its performance doesn’t overpower things. Ok, so here we have the only codex transport available to the Tau, and it’s not cheap. It certainly plays well with others and is capable of bringing noticeable fire support as you’d expect from the gun masters of the 40k universe. One thing a lot of people tend to underestimate about the Devilfish I find is its resilience. AV12 at the front means it’s substantially more tough than the Rhino (it would have to be given its cost) and enemies often have to manoeuvre into its side/rear arcs to reliably take it down. The key thing here is that this, combined with its ability to jink, means you can pretty much expect it to deliver its payload where you want it to. I love the devilfish on the tabletop, they bring out a lot of the benefits of the new units and formations from the codex and most essentially they allow the Tau to play a really manoeuvrable force in maelstrom missions that their popular gun line approach never did. I’d never leave home without them, but then I really like and am used to playing a mobile army. Morning all, well there was plenty spilt this weekend wasn't there! As ever, whilst this is not a blog based round rumours, we know from GW that there's a new supplement coming for the space marines and there's plenty of information out there if you want to find it. Thankfully for you good people, I've been doing a reasonable amount of analysis of what we've seen so you don't have to! Innate - they are jet pack infantry after all. The basic stealth team is equipped to take out light infantry, with each model coming with a 4-shot burst cannon boasting S5 and AP5. Guardsmen will weep at this massed firepower, but that’s not why you take stealth teams. One model per 3 can be upgraded to carry a fusion blaster, which is the longer ranged Tau version of the meltagun. Ordinarily this would be a bad idea since the two targets are very different, however the stealth suit can be equipped with a target lock allowing the fusion blaster to fire at a different target to the unit. On that basis alone, the unit is highly flexible. Minimum unit cost is 90 for 3 suits, though a 6-man unit can run to 395pts if you equip them all with shield generators, drone etc. Realistically the above cost is way beyond what you would spend. When I take stealth suits I keep them to 3-man teams and I’ll usually spend 100-120pts on them, including a fusion blaster, usually a target lock and often a homing beacon. Very much so - the stealth suits have infiltrate, and come stock with stealth and shrouded so can be incredibly useful for denying space for enemy infiltrators, keeping the foe at arms length, which is exactly where the Tau want their opponents. The ability to take a homing beacon is also invaluable, as this allows you to bring reinforcements via deep strike without scattering, whilst their 3+ armour and insanely good cover saves unless they’re in the open mean they’re very difficult to shift early enough to stop those accurate deep strikes. Taking a fusion blaster and infiltrating can also often mean you’re taking out enemy armour early and forcing transported units to foot slog towards you, giving your weapons every opportunity to do their work. Prior to the advent of formations, you very rarely saw stealth suits in an army, but thanks largely to the introduction of the optimised stealth cadre, you now see few lists that don’t have them. I wouldn’t say they’re essential but the formation benefits, allowing them to get a boosted BS, ignore cover and hit vehicles on the rear armour if they’re close to the ghostkeel means they are highly desirable. It’s perfectly possible for a unit of three guys to take down 3HP vehicles on turn 1 with these rules. Modest really, generally you’re looking in the 8-12 range, though if you do max out the unit then 24 is your max requirement. High fire rate of the burst cannon means they’re pretty reliable, though you need to account for their standard BS3. Formation benefits can really boost this up to 5 without the need for marker lights, and the only really susceptible weapon is the 1-shot fusion blaster since there’s no option for twin linking it. Probably a Stilton if taken with the OSC formation noted above, or cheddar outside it. 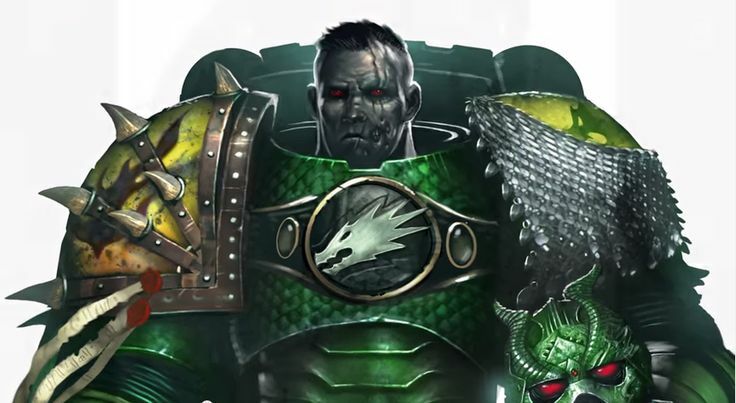 I love a stealth team, and whilst they weren't the best under the old codex, the formations in the new book, particularly the optimised stealth cadre, bring sufficient bonuses to them to make them extremely viable these days. The unit itself wasn't bad under the old rules, just overpriced for what it did. The advantage of the OSC therefore it that it makes the stealth teams do more for their cost, thus making them more worth taking. The way I build my tau lists, these guys really do provide the glue that holds everything together and greases the wheels of the power units. Fusion blasters pop the occasional tank exposing the soft innards whilst the burst cannons can wreck others. The stealth teams also bring homing beacons to bring in the big guns exactly there they will do the most damage. All these niggly little effects would be nothing to your opponents except for one thing - they’re also incredibly hard to kill, despite their average toughness. 3+ armour and stealth+shrouded means not much is actually getting through to their squishy insides. All in all, a highly useful unit that causes more trouble than it’s worth to get rid of and makes everything else in your army work just that little bit better. Greetings all, here's another unit review, this time focusing on the Tau piranha. Nippy little irritant unit that’s great for launching long-range turn 1 anti tank, and then grabbing objectives later. Innate - short of Eldar Jetbikes this fella is about as fast as they come. The Piranha will almost never be the focus of your army, however they come with plenty of flexibility. Without upgrades, they are pretty much an anti-infantry harassment unit, with a burst cannon and a pair of twin-linked gun drones meaning that the model is capable of kicking out a respectable 8 S5 shots, with a mix of BS3 and BS2 twin-linked meaning you should see about half of those hit. For a modest cost, you can switch out the burst cannon for a fusion blaster, which if you’re taking the hunter cadre is well worth doing, as it gives that gun a double-dice penetration range of 39” (providing you start close enough to your commander), which will cover most of the board. The piranha can also bring a couple of seeker missiles along for the ride, which, quite frankly, make them a sickeningly effective threat given their modest cost. Thanks to the miracles of markerlights these can target anything on the board just about, hitting on 2+ and ignoring cover at S8 and AP3. In my view, they make the perfect launch platform as the piranha is both small enough to hide fairly easily, and fast enough to be able to influence the game later even if you do start well away from danger. My personal favoured target from them is the ever-annoying thunderfire cannon - a couple of piranhas loosing seeker missiles via markerlights should easily be able to take one down in a single turn, and that’s more than doubling your return on investment. The Piranha quite simply has all the necessary tools to take on just about any target in the game, though you probably want to steer clear of gargantuan creatures, unless you’re bringing a big squad with lots of seekers! 40pts basic, up to a frankly ridiculous 125 if you take everything it can have. Realistically for an open-topped, 2HP skimmer you don’t want to spend too much on them. The basic model is fine if you want to target infantry, 50pts for a tank hunter is quite reasonable and 66pts gets you twin seeker missiles as well. A disruption pod for a 3+ jink would take you up to 81, which is probably getting a bit much for the chassis really, so I’d say go either/or with the disruption pod and the seeker missiles. Markerlights. Say no more! Ok, maybe I can say more here - because the drones can be dropped off to allow them to target a different unit, there’s no need to waste the Piranhas firepower, and it’s cheap enough to be used as somewhat of a sacrificial unit if you’re looking to pop transport tanks. One thing the Tau do kind of lack is a longer ranged early turns anti-tank (genuinely here, not just high strength) weapon, and I think that the Piranha used in combination with the hunter cadre rules grant them that option. Do you need it? Absolutely not. However, if you’re looking to build a hunter cadre on the cheap then the Piranha is your cheapest option (granted, not by much, but every point counts in a Tau list I find). I think given the roles I’ve outlined above though, the Piranha is very much a desirable unit, and can really help the Tau in Maelstrom missions, where a lot of their firepower can be quite static otherwise. Pretty hit and miss here, the anti-infantry version does bring a lot of shots so can be fairly reliable, however if you swap out the burst cannon for a fusion blaster you’re relying on a 1-shot BS3 weapon. I’m just sayin! Depending on the loadout, a fairly mild cheddar for the basic anti-infantry kit, to a pretty strong cheddar if you’re looking to hide out and use markerlights to launch krak-missile equivalents around the board before zipping out to bust tanks and claim objectives. 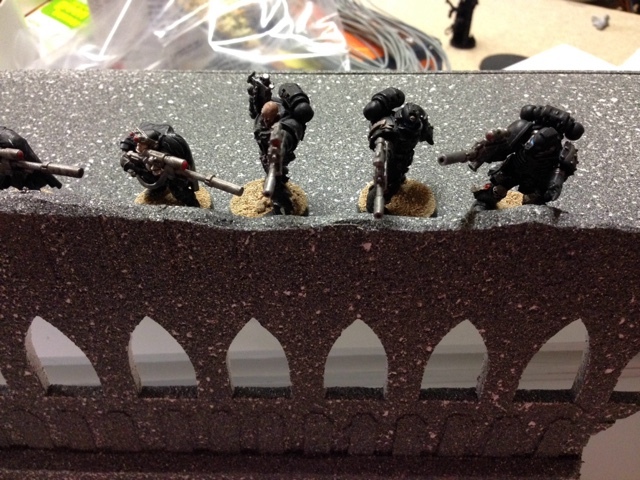 Hobby update - more Dusk Knights! and a question. Greetings all, welcome once more to the painting desk of the Burning Eye. The above picture was how I left you last time, with my painting mojo being sucked from me by the insatiable time thief that is the space marine drop pod. Greetings all, welcome to April! I'm postponing my normal hobby update until tomorrow, so that I can do my now regular monthly review. 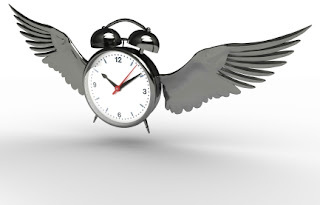 My gut is that March hasn't seen much progress, and very much fizzled out as my eldest daughter's birthday took priority (roughly a week of various trips to friends, relatives and party preparations). Greetings all, today is just a quick post containing my entries for Dave Weston's Adsense competition over at 40k addict. The second has been a bit more of a project, though I'll admit, it's not finished! 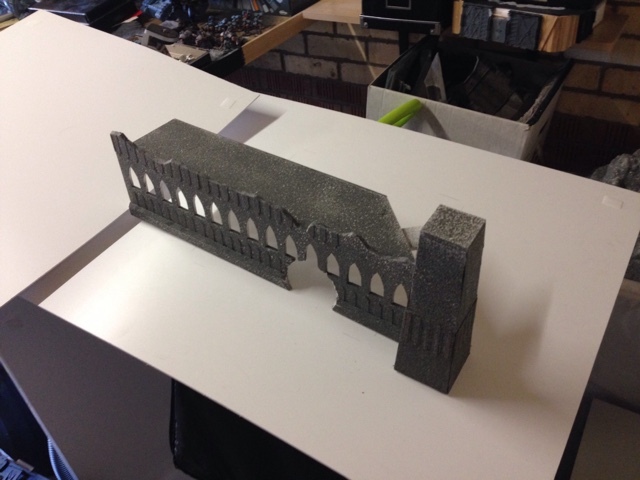 The brief was to submit pictures of free things available from the 40k addict blog, and I decided to have a go at building some of Dave scenery. 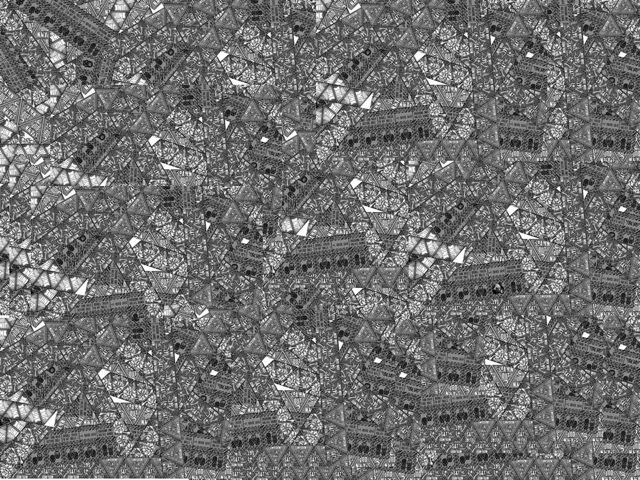 Not one to do things be half however, I decided that rather than just slavishly build one of the buildings from the templates, I would try to show just what could be achieved by using the templates as a base to create much more ambitious buildings and scenery projects, and that whilst the templates as they are give you plenty of scope for awesome buildings, a bit of imagination takes you so much further. Ok, so that's the philosophical crap out of the way, what did I actually build? 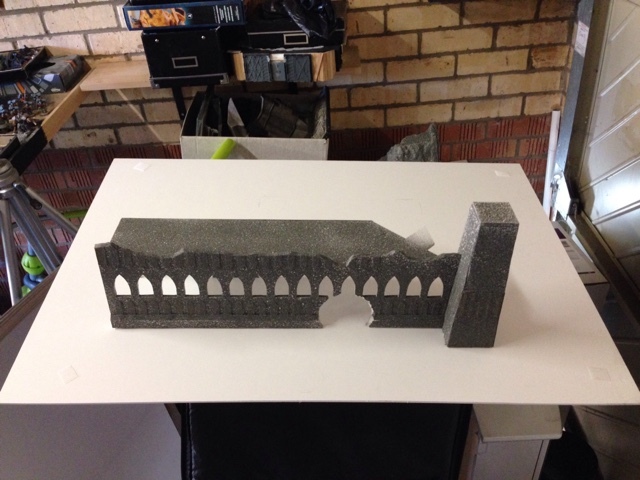 And now a plug for my own project - this piece will be making an appearance as a table centrepiece at hero for a day - it's designed as a convent type building and may very well have some battle sisters playing over it at some point on the day!